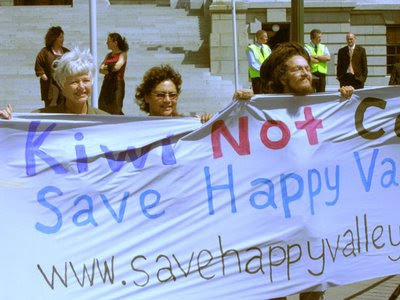 Green MP Asked Parliamentary Questions For "Eco-Terrorists"
Green MP Metiria Turei has been a staunch supporter of the Save Happy Valley Coalition. As Green Party conservation spokesman Turei has spoken on behalf of the organisation at public meetings and has trekked into Happy Valley to support the troops. At one stage Maureen Howard, Metiria Turei's Outreach Coordinator was Dunedin contact for SHVC. Ms Turei has even extended her support to asking parliamentary questions for SHVC. SHVC has committed several illegal acts in Happy Valley, costing state owned Solid Energy many millions of dollars. To counter this criminal behaviour Solid energy has called in police and a private security company Thompson&Clark. Metiria Turei has used her Parliamentary position to ask questions on police operational matters and Thompson&Clark for the benefit of SHVC. Does he have a copy, or has he ever had or seen a copy, of any Thompson and Clark reports provided to Solid Energy on the activities of the Save Happy Valley group members? Ms Turei's affinity for SHVC may extend beyond her conservation brief. She comes from an anarchist background and SHVC is largely anarchist run. No fewer than five SHVC activists, all anarchists, were arrested in the October 15th 2007, anti terror swoops. All face firearms charges. At least one other SHVC activist is believed to have attended a "quasi-military" training camp in the Urewera Mountains but was not arrested. If the five are convicted it will further prove that Solid Energy was right to put SHVC under surveillance. It will also confirm what some have long suspected-that SHVC can properly be classified as an "eco-terrorists" organisation. Should Metiria Turei be using her Parliamentary position to help these people? Surely an MP's job is to uphold the law, not assist those intent on breaking it? Uphold whose law? Solid Energy broke the law when it hired Ryan to infultrate the group by sending group information to Thompson and Clark who also hired him to join the group. Solid Energy wasn't costed millions of dollars in Happy Valley, they were costed by the miners strike and then the delayed coal shipments from the time delays involved in meeting the conditions for mining at Mt Augustus. Don Elder confirmed they would likely make up the cost that shipment delays had over the year. Solid Energy intends to mine a wetland, destroy Kiwi habitat and then export it to steel giants in Japan, China and elsewhere. Metiria has supported the protection of the West Coast Wetlands and the illegal activities Solid Energy conducted when they hired spies to monitor environmentalists campaigning against Labour's newest proposed coal stripmine cashcow. Solid Energy has been awarded an eco terrist award for its environmental vandalism. Onece more a reminder - none one in the armed raids and occupation (which is now being taken to the UN) were chared with terrorism charges. So there is no 'ecoterrism' except in your imagination. Why not turn up to a Save Happy Valley event in Christchurch and argue your climate skeptic, pro labour coal energy position in person? do you like solid energy sending coal to 'communist' china? "SHVC has committed several illegal acts in Happy Valley, costing state owned Solid Energy many millions of dollars." Nobody has ever been arrested, charged or convicted for any act committed in Happy Valley. Get your facts right. Oh, and you're still peddling the incorrect claim that 5 of the Urewera 16 are/were involved in SHVC. You make the mistake of assuming that because I'm anti SHVC, I am therefore pro Solid Energy. The company has at least 2 black marks against it in my view. I am happy to discuss my ant Happy Valley views in person, but I doubt it would achieve a lot other than making me more easily able to identify your supporters. Asher-you tell me which one of the 5 has not supported SHVC in some way and I'll re-check my sources. BTW-how about removing the "child molesting" stuff and the links to the bogus bebo page from your Indymedia thread. I only publish stuff I believe to be true. That stuff is highly defamatory and you know it to be untrue. Exercise your editorial responsibilties and show some integrity. "SHVC has committed several illegal acts in Happy Valley". What evidence do you have to back this up, Trev? how about laying across the tracks!! "how about laying across the tracks!!" That wasn't in Happy Valley. It was in Canterbury. "That stuff is highly defamatory and you know it to be untrue." Thats a bit rich coming from the master defamer himself isnt it? specially considering he accused lot of people of being terrorists even once overblown police charges wer dropped. Trevor - I've told you before which one of the 5. I've hidden the child molesting post as it broke the AIMC editorial policy. Apologies for not hiding it before. If you think a post has broken the editorial policy, you can do what everyone else does and email imc-aotearoa-ed [at] lists [dot] indymedia [dot] org and ask for it to be removed. I won't hide the fake bebo profile post as its obviously satire. Not particularly funny satire, if you ask me, but satire nonetheless. Sorry ASher but you actually didn't tell me which one-unless i missed it. Thanks for removing that. the stuff about Geoff Loudon is a bit dodgy. I've never heard of the guy. He certainly isn't my uncle, unless there's some family secrets I don't know about. I don't mind being linked to him, but he might not like being linked to me. The stuff about the Loudon/Rankin connection is interesting though. Apparently some of us did come from Ayrshire, so maybe there is a connection. First, Should Turei declare her interest on this, being of the Tuhoi tribe? Second,the personal attacks on Trevor Loudon seem to come from the loony mob who don't want coal exported. If the country runs out of dough who will supply the handouts and free loans that sustain these bludgers? Sell the coal while there's still a market. Still waiting to see your evidence of "several illegal acts" in Happy Valley, Trev. Put up or shut up. Amazing how the far-lefties climb on every band waggon. Now they're trying to hijack the anti global warming campaign. Look at the abysmal environmental record of China and the countries once part of the Soviet Union, though. Most of them are appalling cesspots environmentally. The poster above who more or less boasted about protesters stopping trains by lying on tracks should take care. Some day, a loco driver mightn't see of them or the publicity their snail loving mates have created mightn't get through to train control on time. Lying on train tracks is stupid. And if it costs Solid Energy money it costs NZ taxpayers money as we all own it. Less for Health, less for education, and perhaps even for those who live in the sticks with molluscs at taxpayer expense.